Tonight I got to see Evil Dead the Musical at the Broadway Playhouse in Chicago and had a good time. Like Rush, this offering is a Canadian import. Also like Rush, I think it is probably an acquired taste. If you’re a horror fan or an Evil Dead fan, this show is going to be right up your alley. The audience feels more like attendees at a horror convention than typical weeknight theatergoers. And the jokes generally require an appreciation for– or, at least, working knowledge of– the Evil Dead films and Bruce Campbell. 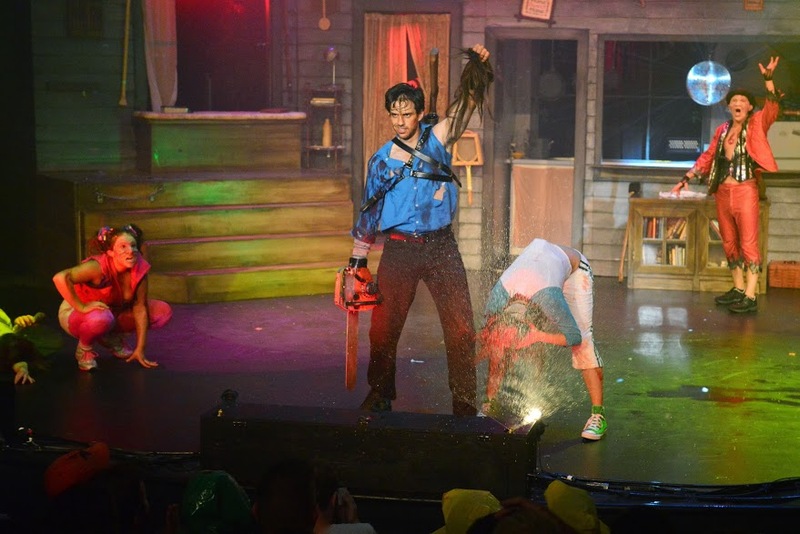 Evil Dead the Musical celebrates Evil Dead the movie, and also kind of pokes fun at its weird excesses and foibles. At times, watching it felt like watching MST3K, but with Tom Servo and Crow actually playing characters instead of just making jibes from the sidelines. Yet parts of this creation will be an absolute delight for fans of horror. Andrew Di Rosa’s performance of “Good Old Reliable Jake” was probably my favorite part of the show, and definitely brought to mind South Park’s skewering of Stephen King’s yokels. Did I think Evil Dead the Musical was perfect? No. Some of the jokes definitely fell flat or seemed dated. This was not the fault of the cast, but of the writers. This musical has been around for a while. I felt like some of the references needed to be punched-up. Lock a bunch of comedy writers in a room over a long weekend with the script (and a bunch of espresso), and I’d lay you odds almost all of the halting misfires could be replaced with effective jokes by Monday. Misfires aside, there is much good here. If you’re a horror fan (or, indeed, a Gwar fan) you will find a great deal in this production to appreciate. I not-so-respectfully beg to differ.